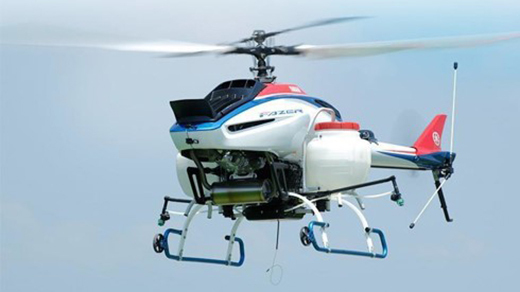 Yamaha has a long history with the operation and development of Unmanned Aerial Systems (UAS) dating back to the development of the R-50 which was completed in 1987, with commercial use and distribution beginning in 1991. The R-50 was the first commercial UAS platform manufactured by Yamaha, using a conventional main rotor and tail rotor design and powered by a 2-stroke, 2 cylinder, 98cc, 12 hp engine that was capable of carrying a payload of 44 lbs. The R-50 used gyro sensors, which was cutting edge technology at that time and provided added stability to the aircraft. Later versions of the R-50 introduced the Yamaha Attitude Control System (YACS) which made automatic control of all axes possible. 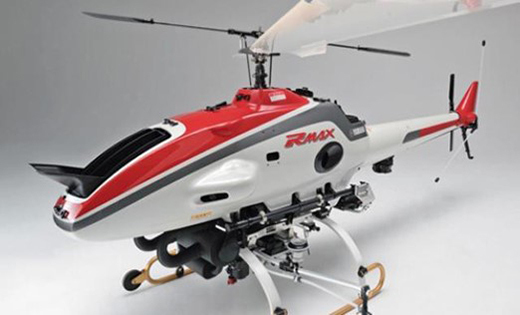 Building upon the success of the R-50, Yamaha introduced its 2nd UAS platform, the RMAX in 1997. The RMAX featured a newly designed 246cc, liquid cooled, horizontally opposed, 2 cylinder, 2 stroke engine. The RMAX also featured a slightly larger airframe, with a maximum payload capability of 62 lbs and a total maximum takeoff weight of 205 pounds. The RMAX had both granular and liquid sprayers, with 16 kg and 16 L capacity, respectively. In 2003, the RMAX Type IIG was introduced that featured improved safety functions and better overall usability. The RMAX Type IIG features a GPS system that will hold the aircraft’s position over the ground allowing hands free hovering, as well as stable flight characteristics and spray rate control. These new features greatly enhanced the operability of the unit, making it easier to learn and pilot the system. The RMAX Type IIG also appealed to new markets, as it became a tool for utility functions such as volcanic sensing, radiation monitoring, etc. The next development milestone involved the introduction of the next UAS platform, the FAZER, featuring a new 390cc, horizontally opposed, fuel injected, 4 stroke engine with a newly designed airframe that uses a shaft driven tail rotor as opposed to the belt driven tail rotor used in the RMAX. The avionics were updated to the YACS II system, and the spraying payload capability was increased by 50% compared to the RMAX. The FAZER also included a “cruise control” feature which allows it to maintain a heading as well as its forward or reverse speed after the stick is returned to neutral. Most recently Yamaha introduced the FAZER R in late 2016, which includes added payload capabilities compared to the FAZER. The FAZER R carries a payload of 32 kg or 32 liters; a 33% improvement compared to the FAZER and double the capability of the RMAX. The FAZER R features a performance tuned 390cc 4 stroke engine with a higher output to handle the increased payload. The tail rotor was redesigned to counteract the rotational forces caused by the increased weight.